I am not sure I possess the vocabulary to do justice to this spectacular dinner at Marea. 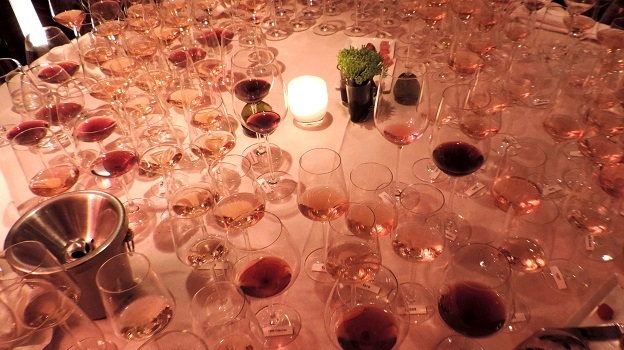 Icons from Bordeaux and Piedmont followed nine vintages of Cristal in a night of great wine, food and conversation. Dinner at Marea was excellent. The cappelletti filled with beef short ribs were outrageous, as was the sea bass. My only complaint in the food department is with the tagliolini, which were excessively salty. As it turns out, I had tasted the same dish just a few days earlier, so this was almost certainly a small slip up in the kitchen. Wine Director Francesco Grosso took care our table with his usual aplomb and levelheaded calmness, while service was exceptional. The 1988 Cristal, served from magnum, kicks things off. A first magnum isn't quite perfect but the second is pure magic. Rich, powerful, yet super-finessed, the 1988 impresses for its overall harmony. Hints of almond, pasty, honey and chamomile flesh out on the textured finish. The 1988 Cristal isn't as powerful or acid-driven as other wines are in this vintage, rather it is the wine’s exceptional balance that impresses above all else. 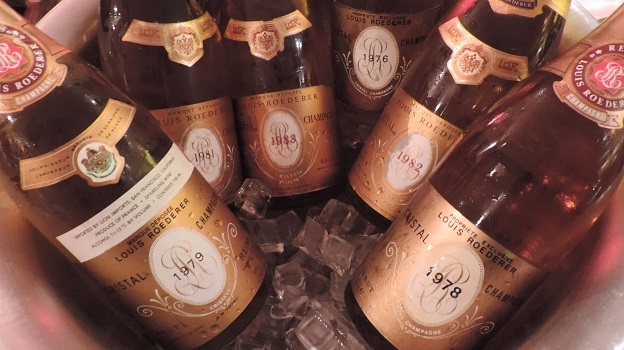 Tasted next to the Cristal, the 1988 Cristal Rosé is bit softer, silkier and more resolved. Sweet hard candy, flowers and spices form a fabric of exquisite beauty. It is interesting to see that after all of these years, the two 1988s have converged. A soft, feminine wine, the 1983 Cristal is all about balance and harmony. Round, seamless and impeccable, the 1983 is a gorgeous spot today where the flavors are mature, yet the wine retains enough depth to deliver considerable pleasure for at least another handful of years, although there is no more upside to be had. Still, it is amazing to see just how much the 1983 gains with air. Hints of caramel, almonds and spices round out the finish. This is a very pretty Cristal. Power, intensity and phenolics are the signatures of the 1982 Cristal. One of my personal favorites, the 1982 is bright, tense and vibrant to the core. I very much like the sense of energy here. The aromatics could be a touch more precise in this bottle, but the trademark 1982 structure is very much on display. The 1982 remains one of my all-time favorite Cristals. The 1981 Cristal is one of the biggest surprises of the night. Although it is fully mature, the 1981 is fabulous tonight. Hints of roasted almond, orange peel, caramel and spices suggest a fully mature wine, yet the 1981 has a sense of energy and overall symmetry that is impossible to miss. The 1981 won’t last forever, but it is without question one of the most rewarding vintages to drink today. The 1980 Cristal, tasted from magnum, is the subject of much discussion. It is a beautiful wine. No, it is much more than that. It is profound. At the same time, though, extended time on the lees has yielded a Cristal that is not especially ‘Cristal-like;’ as the aromatics are very much on the reduced side. In 1980, Roederer bottled the entire production of Cristal in magnum only because production was tiny. Roederer does not have a formal late-release program, but this magnum spent more time on its lees than was the norm, and it is therefore quite a bit different in character than is the norm. One of my all-time favorites, the 1979 Cristal is singing. Honey, almonds, orange peel, spices and rose petal grace the palate in an utterly exquisite and unforgettable Champagne. The 1979 stands out for its sense of phenolic richness and weightless intensity. If I could only drink one vintage of Cristal, 1979 might be it. Another pretty, mature Champagne, the 1978 Cristal is all about texture at this stage. Orange jam, honey and wild flowers are some of the notes that open up in the glass. Initially quite compact and tight, the 1976 Cristal does open up a bit with air, but even that is not enough to compensate for a less than perfect cork. That is a shame, as the 1976 is special, moving Cristal, but on this night only a fraction of the wine’s pedigree is on display. As move into the reds, a bevy of truly spectacular, moving wines awaits. Where to being? An utterly magical, spellbinding wine, the 1959 Lafite-Rothschild is utterly sublime. Sweet red fruit, smoke and iron notes begin to unfurl in the glass, but ultimately it is the wine’s total sense of silkiness and finesse that leaves everyone at the table in awe. It’s hard to imagine wine – any wine – being more profound than this. But just then the 1959 Haut-Brion arrives. Bacon fat, smoke, graphite, spices, soy and cedar accompany a much darker, more imposing expression of fruit. Served from magnum, the 1959 Haut-Brion needs time to soften, as the tannins remain imposing. I imagine the 1959 will drink well for many, many years to come. On this night, it is awe-inspiring. Bruno Giacosa’s 1990 Barolo Riserva Falleto is terrific, although I have had even better bottles than this. Sweet, sensual and perfumed, the 1990 is all about aromatics and ripe, racy fruit. Sadly, the 1989 Barolo Riserva Falleto is a fake. The lack of vintage stamp on the cork and missing serial number are dead giveaways. The cork and label are authentic, however, and the wine itself is pretty good, all of which leads me to believe this is a 1980s (possibly even 1989) straight Giacosa Barolo or Barbaresco. Taken on its own, the wine is delicious; it just isn’t the 1989 Falletto. The 1988 Barolo Villero, a last minute addition, makes up for the disappointment of the 1989 Falletto. Dark, balsamic and structured, the 1988 is everything Villero is supposed to be. Well-stored bottles should drink nicely for another decade. The 1988 Villero isn't one of Giacosa’s most epic wines, but it is quite enjoyable just the same. What a treat it is to drink the 1961 Evangile from magnum. Rich, intense and almost viscous on the palate, the 1961 is stunning from the very first taste. Mocha, soy, chocolate and dark spices saturated the palate in a deep, massively endowed wine. It is hard to contemplate that the 1961 is now 53 years old. On this night, the 1961 is pure magic. Even after all of these years, the 1961 boasts remarkable intensity and extract. What a thrilling wine this is. I wish every Vinous reader could have the opportunity to taste wines like these. Some wines are good, some are great, but a few transcend even that level and become icons. On this night were privileged to drink some of the greatest wines ever made.